A warm welcome to the Woodspring Lodge No 8791 web site. We are a very sociable Masonic Craft Lodge that meets at the Masonic Hall, High Street, Yatton, Bristol BS49 4D. We meet 8 times a year on the Friday after the 2nd Wednesday of the month from October to May. We also have a number of social events, including an annual Ladies gala dinner dance. See the “Our Events” page. One of our principles is to support others, less fortunate than ourselves. See our “Year / Master” page. The lodge was formed in October 1977, with most of the senior officers being either County or District Councillors. 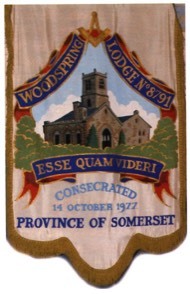 Our lodge banner depicts the Woodspring Priory, near Sand Point about 3 miles north-east of Weston-super-Mare. The Lodge Motto “ESSE QUAM VIDERI” is translated as “TO BE AS ONE SEEMS”. Woodspring Lodge no 8791 under the Grand Lodge of England, Lodge was Consecrated in October 1977 with 25 founding members. From circa 1890 until the mid 20s the Masonic Hall, then known as Larchmount House was a Private Boarding School for Girls. A fire gutted the building in the early 30’s. In 1935 the Brethren of the Lodge of Agriculture decided to purchase the now derelict building and after extensive renovation it was dedicated as a Masonic Hall on March 16th, 1936. During the Second World War the Ground Floor of the building was requisitioned by the Army although Masonic Meetings still took place in the Lodge Room above. 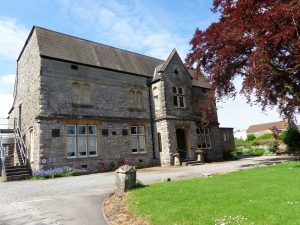 The Yatton Masonic Hall is home to 6 Craft Lodges : Agriculture 1199, Winscombe 6474, Woodspring 8791, Hospitality 9299, Silvanus 9741 and the Forest of Mendip 8019 . Mentor : Bill Lawrence. email : billandc.lawrence@gmail.com Tel: 01275 462056. Each province supports The Freemasons’ Grand Charity. The Somerset Provincial 2020 Festival is aiming to raise at least £2.8 million pounds by 2020, whilst maintaining our help to our own local causes. Our last Festival was in 2007. Recognition of amounts donated are are given to each lodge in the way of Ashlers. These are awarded on an amount transferred to the festival fund on the number of Masons registered with that Lodge. 1st ashler : £200 per member, 2nd ashler : £300, 3rd ashler : £400, 4th ashler : £500, 5th ashler : £700, Golden ashler : £1000. ?? ?Date \?? Woodspring has transferred ???money?? into the 2020 Festival fund. We have been awarded 4 Ashlers. This website is under development…. Any suggestions for improvements, or help with development, of this website would be gratefully accepted and faithfully applied. Please contact Alan Carter (details above).